Fashion designer Kenya Buchanan’s creativity has no bounds. In high school, she once wore an orange shirt and carried around an orange for an event that day. Buchanan, 38, known as Kenya B, won the 2017 Magic City Fashion Week Emerging Designer Competition. Now she is preparing for a New York Fashion Week (February 7 through 15) presentation, during which she plans to combine her two collections—Spice and Fruitopia—and add an extra Kenya B flair. In 2013, Buchanan left a position she held for about 11 years. 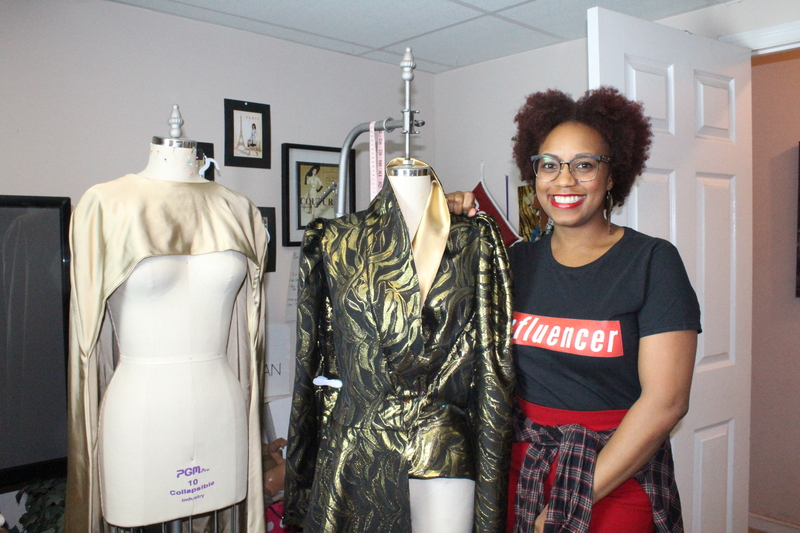 Buchannan enrolled at the University of Alabama to get a bachelor’s degree in Apparel Design. She was so motivated that she drove from her home in Pleasant Grove to Tuscaloosa every day. In 2016, she graduated with straight A’s, something she’d never done before. “[My professors] were pushing me to do internships in New York, but I couldn’t because I had my [husband and two children],” she said, adding that she is rooted in the South. Buchanan grew up in Fairfield and now lives in Pleasant Grove with her husband, who was her high school sweetheart, and their two children: a boy, 19, and a girl, 12. “When people tried to impose their thinking on me, it just really never affected me because I’ve always sort of been a loner. I’m a people person, but I’m a loner at the same time,” she said. Though she didn’t know what path she wanted to follow when she was younger, Buchannan has always been into fashion. At Fairfield High School, she was voted most versatile because no one ever knew what she was going to wear. Still, at that time she was a long way from a fashion career. Her first interest was mortuary science; she thought she wanted to be an embalmer. When she was in high school, her best friend’s cousin was a mortician in Birmingham, and they visited the mortuary. Buchannan enrolled at JSCC to pursue a career in the funeral field but then decided it wasn’t something she wanted. Her next stop was the University of Alabama at Birmingham (UAB), though she still was unsure about her career choice. Several people had told her, “You’ll always have a job if you go into accounting,” so that’s what she did. After realizing that accounting wasn’t for her, Buchannan majored in management, “not knowing I would be running my own design house,” she said. 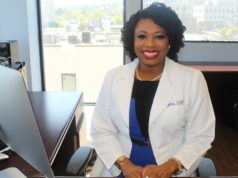 After graduating from UAB with a bachelor’s degree in management, she worked with the executive director of a Fortune 500 company in Birmingham. Buchanan loves fashion that relates to culture. “I’ve always liked wooden earrings. I love graphic [T-shirts] because [they enable you to] say something without opening your mouth. I do what makes me happy,” she said. One day, you may catch Buchannan in all red. Another day, she’ll don all black. “If I’m wearing black, it’s because I’m sad. I typically don’t wear black; … it’s just dull, and I’m such a colorful person. I like color, so what I wear per day depends on how I’m feeling.” she said. When it comes to researching for her fashion collections, Buchanan starts in Africa because she is inspired by African culture and textiles. “I found the marketplaces in Morocco interesting. … When the sun hit the colors just right, it glistened, so I’m like, ‘Oh, Spice!’ Once I got that in my head, I went to the fabric store and started piecing fabrics together,” said Buchanan of her Spice collection. She studied women in Colombia, South America, who carry baskets on their heads: “I saw that they wore ruffles and bright colors, so I put a little spin on it. That’s what birthed Fruitopia,” which launched in 2018. Buchannan is also inspired by everyday life. When walking into different places, she would notice women out and about wearing pajamas and beauty-supply-store bonnets. “[Women] can wear them in the rain [to protect their] hair from humidity, [too],” she said. Buchannan’s bonnets are also a stylish option for children and women suffering from illnesses that cause hair loss. “This year, one initiative I definitely want to launch is for children. I plan to give away a dozen or so [bonnets] to kids who need them,” she said. Another initiative that’s close to Buchannan’s heart is raising awareness about colon cancer. 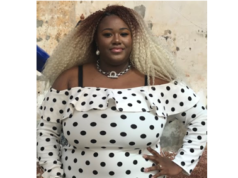 In addition to everything else on Buchanan’s plate, every prom season she donates a dress to a young woman who is a good student and may not be able to afford the prom dress or experience she wants. 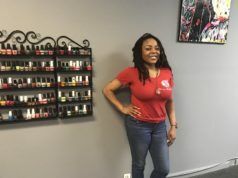 She’s done this for the past four years and usually announces it on social media and chooses a Fairfield High School student, “since I went to Fairfield,” she said. Buchannan hopes her sewing lessons show young people that there are career options available in areas other than accounting, engineering, and traditional fields. She hopes to inspire high school students to pursue more creative livelihoods.